The 35th Infantry Regiment Association salutes our fallen brother, SGT Warren Orison Knepper Jr., who died in the service of his country on June 24th, 1966 in Pleiku Province, Vietnam. The cause of death was listed as Small Arms/AW. At the time of his death Warren was 23 years of age. He was from Tucson, Arizona. Warren is honored on the Vietnam Veterans Memorial at Panel 08E, Line 86. The decorations earned by SGT Warren Orison Knepper Jr. include: the Combat Infantryman Badge, the Silver Star, the Purple Heart, the National Defense Service Medal, the Vietnam Service Medal, the Vietnam Campaign Medal and the Vietnam Cross of Gallantry with Palm Unit Citation. For gallantry in action: Sergeant Knepper distinguished himself on 24 June 1966 while serving as a fire team leader in the 1/35th Infantry Reconnaissance Platoon near Duc Co. After receiving intense hostile fire from a reinforced NVA company, Sergeant Knepper charged directly into the enemy positions and forced a portion of them to withdraw. As his platoon withdrew from the killing zone, he delivered suppressive grenade and small arms fire into the remaining enemy positions. Sergeant Knepper continued to engage the enemy troops until he was mortally wounded. 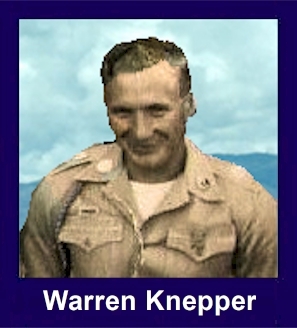 Sergeant Kneppers extraordinary heroism in close combat against a numerically superior hostile force was in keeping with the highest traditions of the military service and reflects great credit upon himself, his unit, and the United States Army. Warren is buried at Lai Cemetery in Lai, Oahu, HI. Laie is located on the eastern shore near the northern end of the big Island. It is on Rt 83 just south of where it turns west and south again. I meet Knepper when we returned from Thailand. in our squad, so it it was a shock to read about Warren. When at Schofield his bunk was the first one on the left just inside the squad bay door. When you went to wake him in the morning you had to use a broom stick handle and tap him on his feet as he would come straight up off the rack swinging. Knipper also loved to go to Hotel street in downtown Honolulu and have fun. He was a great person who loved life. Scotty, You were just a youngster when I knew you from Canton Ohio. I left for the service in 1953 and we lost track as your parents moved to Arizona. The next I heard is that you were the first soldier from Stark County, Ohio to die in Vietnam. This made the front page in the Canton Repository at the time. I was sad because of the way things were for you and you had such a short life. There was a Memorial Park constructed in Massillon Oh. honoring Stark County veterans. I made sure you name was added even tho your home was listed as Tuscon AZ. Scotty, I will not forget you and the sacrifice you made. Rest in peace my friend, you deserve it.